If you are browsing the web and checking out a few food challenge & competitive eating related articles, posts, and videos, you will more than likely find some random comment with nothing but the three word phrase, “Meanwhile In Africa.” This trend began a few years ago as a joke to make fun of different stereotypes, luxuries, and customs that certain groups of people (mostly Americans) have that less fortunate people in other parts of the world are not able to enjoy. The phrase can also be used to belittle people that are complaining about very insignificant issues that are not really “problems” compared to the real-life dilemmas and situations that other less fortunate people are dealing with around them. Many other countries and continents could be chosen, but since Africa is known to be full of poor, little third-world countries facing a wide variety of problems, it typically is used the most. For example, on a video of an eating contest or food challenge where a large amount of food is being consumed, especially if the winner is being celebrated at the end and applauded, somebody will write “Meanwhile in Africa,” because people over in those starving countries will most likely never get an opportunity to experience anything like that during their lives. There are starving people everywhere – No matter what city you are in around the world, there are multiple less fortunate families within 5 to 10 miles of you that are dealing with financial issues. Houses and properties are being foreclosed everywhere, and people are being forced out of their homes, and many of those people don’t have anywhere else to go. You obviously have the internet signal required to find this article, but many families around you cannot afford it, & they cannot afford multiple meals per day either. To use a group of people in your argument thousands of miles away that you will never actually help is ignorant. Instead of wasting your time criticizing people that don’t care about your opinion, use that time productively to go volunteer and help the people in need around your local community, which is what many competitive eaters are doing already. Many eating events and challenges involve charity organizations – Most active competitive eaters and food challengers are well aware that we are very fortunate to be able to do what we do. I myself have gotten over $3000 worth of food and restaurant gift certificates donated to different organizations throughout the USA during my different events. 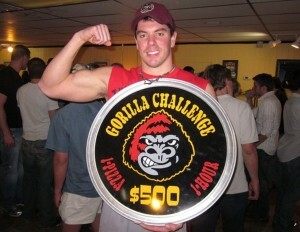 The picture used for this article is from when I beat a 24″ pizza challenge in Kansas. The owner had a ridiculous “professional eater clause” restricting me from winning the $500 cash prize, but I contacted him anyway. Upon winning, I received $500 in restaurant gift cards which were then donated to the local Special Olympics office so that food could be provided at one of their events. I know many other eaters that do what they can to help different charities too. Many restaurants host events where all extra proceeds go to an organization in their particular community, or to a local family in need, and this happens very often. FoodChallenges.com will be helping the community – Our main goal is to #feedthemovement, but that one goal can be broken down into many different aspects and subgoals. One of those subgoals is that once a strong community of eaters, fans, and promoters has been built up, we will be able to help each other as well as the local communities that we are involved with. As one strong and focused group, we will be able to help a lot more people in a lot more places in a lot more ways. To help other communities while our own people need help is just plain ignorant and a poor use of resources, and that will not happen. Before you ignorantly criticize what we do, why don’t you contact us about setting up an event to help your outreach organization, if you even have one. Things can get as ignorant as you want them to – To say it is ridiculous to celebrate people being able to eat a lot while other people are starving is ignorant, but it is way more ignorant to use that as an argument while not realizing that there are thousands of other luxuries that we have that some countries and people do not. If you want to get ignorant with us, we can take it as far as you want, and there really is no end. If you take a shower with running clean water, that is two things right there that many people don’t have. To swim in a pool while drinking bottled water, and then stepping out on to a freshly watered lawn, all while many people don’t even have any clean water??? How dare you??? Before you throw a stone at us, know that we have a mountain of boulders to throw back. That doesn’t exactly make what we do right & justified, but it does make you wrong. I am not an economist or politician, and will not be giving any type of opinion as to why there are starving and less fortunate people in the world, but I do know it is a fact that those people would still be starving and less fortunate even if competitive eating and food challenges did not exist. Feel free to read the article Are Food Challenges Wasteful?, if you have not already, to find out why food challenges and competitive eating are not any more wasteful than anything or anyone else. After reading that article, check out Are Food Challenges Gluttonous? to find out why they are not gluttonous either. Whether you agree with our food challenges and competitive eating or not, please know that we are going to do it anyway. If you are against it, please know that it would be better to focus your efforts on what you do believe in, rather than fighting a battle you can’t win. #FeedTheMovement, or you will get eaten up if you go against it. I will be the first to tell you that I am not the Mother Teresa of our generation, but I am always willing to help others and give back when I can, and I will never look down up or criticize other people helping others either. With that being said, if you have any ideas that can involve FoodChallenges.com helping the community (hopefully food related), please make sure to contact us.